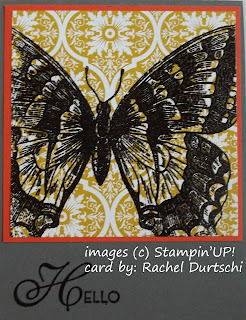 Have you seen the Swallowtail Background stamp in the new Spring Mini Catalog? It is absolutely gorgeous. I love the artwork on this stamp, its so realistic. The card on the left was made by my friend Sue Adams. Sue is one of my downline. She used neutral colors on the project because this was a sympathy card. The writing for the background on this card is actually another background stamp called En Francais. The tiny little sympathy sentiment is from a set called Teeny Tiny Wishes. The card on the right has a little more color. This one was designed by another friend: Rachel Durtschi. Rachel is a sideline. 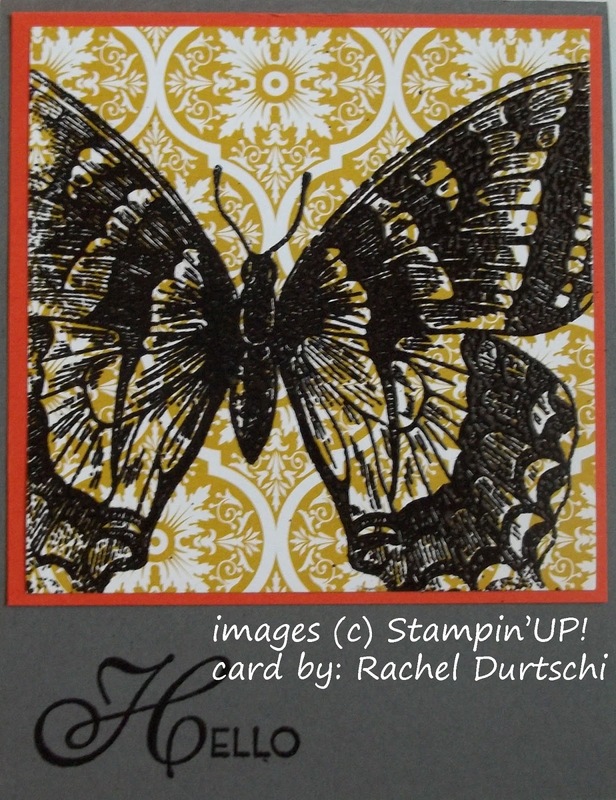 Rachel's card uses Designer paper for the background, which shows through the wings of the swallowtail to give the butterfly some color. 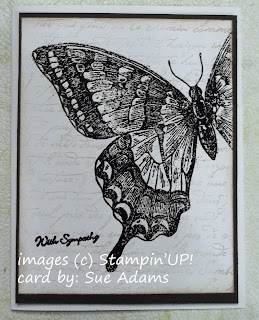 The swallowtail image on both of these cards was heat embossed with black embossing powder. Can you see how shiny it is in the photo to the right? 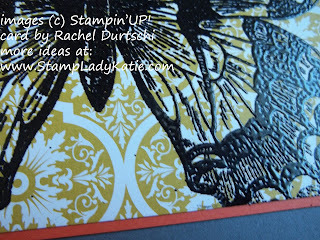 Embossing powders add a really rich texture and feel to a project. Are you wondering about the words "downline" and "sideline"? 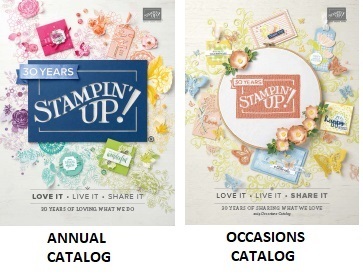 These are words used in companies like Stampin'UP! where the product is sold through direct sales. 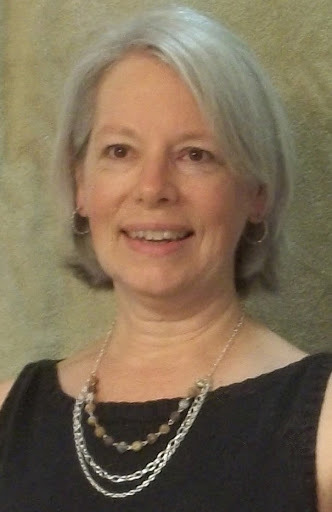 Sue is my downline because she bought her Starter Kit from me. Rachel is a sideline because we both have a common person above us in the "chain" of demonstrators. But what that really means is that we are part of a group that supports each other. We support each other's business and we support each other in growing our skills as stampers. We are lucky to have a very active group. Those of us who are local meet once a month. We have bigger meetings several times a year and some of the people who are further away travel in for the weekend. Our group also has a few folks who live out of state - but those people get our support too. We have some private websites where we post photos and share ideas. And they even participate when we trade cards - they just mail in their contributions and we mail ours to them. Having a group is such a great benefit when you are developing your skills as a stamper. Some people in our group (like me) are running an active stamping business. 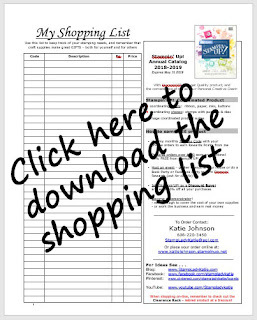 Others are hobbyists who bought the Starter Kit as a way to acquire lots of product at a reduced cost. What we all share is a common goal to get better at what we do. Our group is open and welcoming. Contact me if you'd like to get the Starter Kit and Join the Fun. Or get your's on-line now.